We finally have rain in Mumbai! The heavy, monsoon, blissfully cooling type that last for hours on no end. We spent the last two weeks seeing practically none of it, dealing with the same Summer heat and humidity all over again while the municipality announced the possibility of water cuts as the lakes were starting to be alarming low. Then, on Wednesday in the wee hours of the morning, the heavy downpour woke me up and lasted the whole day with rare intermissions. Ishita's school bus had trouble getting on schedule, and for the first time this season it felt like a proper Mumbai Monsoon. After dropping my daughter on the bus, I made myself a cup of tea, put some soothing music on and just sat enjoying feeling a bit cold again, no force strong enough would have pulled me from my blissful rest (beside I didn't sleep much having watch Switzerland going against Argentina the night before). It is this morning, with the rain still on that I remembered that somewhere in my notebooks, there is a list I made during the Summer. A list about the things you can do to celebrate the monsoon. A list I made to bring me some comfort from the sticky icky humid heat of late May, when you beg for deliverance. - Eat pakoras. There is no better time to do it than on a suddenly chilly wet day while sipping tea and watching the rain fall. For those not in the know, pakora are bits of vegetables dipped into a batter of besan flour and deep fried...enjoyed pipping hot. - Go to a neighbourhood chaat shop, in your favourite sweat pants or confy clothes just to enjoy a hot samosa, or jalebi. Come back home, a bit wet and drink some tea enjoying the feeling of having felt cold again. - Grab your favourite mug, fill it with your favourite tea and go sit at your window or balcony to watch the downpour...and do nothing else but that. - Spend all your time home in your favourite sweat pants...it is finally cold enough again to wear them on a heavy rain day. - Light candles around the room, simply because they pair well with a grey rainy day. - Take your kids to the nearest park to look for monsoon creatures, such as snails, caterpillars and millipedes. You can do it even with no kids. - Feel like a child again, go out in the rain without an umbrella, get wet, and come back home to a dry soft towel and warm clothes before having any of your choice of comfort food or drink. - Get yourself a bright umbrella, funky plastic chappals, just because it is fun and you can get away with it. - Confine that pesky laundry that take ages to dry to a room you don't use often not to spoil your mood. 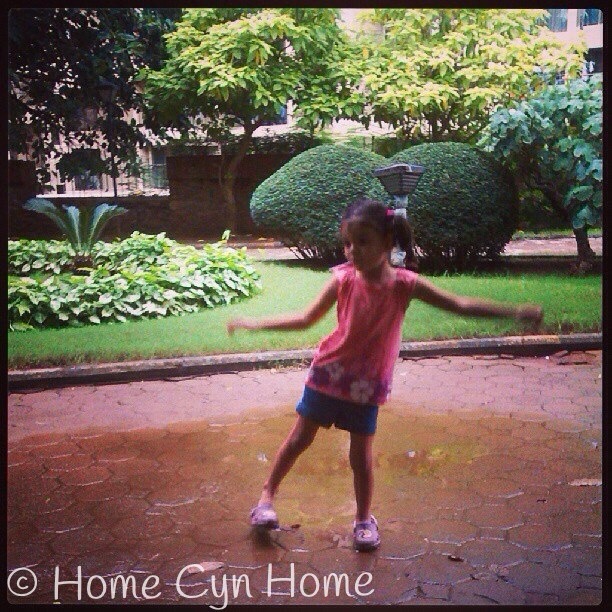 What are your favourite things to do during the monsoon? Great! I'm happy for you! I was hoping for some rain and storms from the tropical storm that was passing to the east of Florida, but it was too far east. It just landed in North Carolina as a category 2 hurricane, so I'm glad it didn't come too close to us. Do you have to close the windows during monsoon rains because of blowing rain or is it just downpours? I love rain as long as it isn't at night and as long as I'm indoors! I got drenched last week just walking a few feet in a downpour. I'm glad you have relief from the heat. Oh, you eat jalebis. They are 'surgar bombs' for you. They are, and I rarely have them, and never more than one, most of the time I just nibble on half a jalebi, they are my husband and Ishita's favourite more than they are mine, I prefer salty snacks in general. We have to close the windows on occasion, but the strong winds are usually at the start of the monsoon and once I treat rears, after that it just a heavy downpour with no wind so I leave the windows open then because it otherwise become very very stuffy inside. In Chandni Chowk, Delhi, there is a famous jalebi shop. The jalebis are so big they are called "Jalebas". Rains were fun in my childhood. Now rain means traffic snarls, even in new delhi which has better roads than rest of delhi. We had a dust storm last months which knocked off the power supply lines and caused power outrage in many parts of Delhi for days. I grew up in a government colony, so power and water supply was assured. In those days ofcours much of Delhi was wilderness so power demand was also less. It used drizzle for hours earlier. Not any more, perhaps even god is mericiful on us. With this kind of infrastructure he too cannot afford be too benovelant on us. Keeping this in mind, he is very generous with summer and winter but not with rain and wind. Thus, we have less rain and even less dust storms these days. Talking of rains, I saw pictures of rain water getting into the coaches of Mumbai metro. Hope this does not happen to delhi metro. The rain in Mumbai can be very extreme, so that leaky metro thing while scary was not totally unexpected. It apparently turned out the coach was having a faulty AC vent that caused the leak, they changed the coach as soon as they noticed. We had a dust storm in the city just before the monsoon hit us, it was due to strong winds from a cyclone over the Arabian Sea, and it is still believed it was responsible for the poor monsoon start we had as it sucked a lot of the humidity out preventing the monsoon to settle. That damn dust didn't cause any power problem but left most of us with watery eyes, itchy throats and heap of dust in our homes for two days. I'm glad the monsoon season has finally arrived. I also live in a hot, humid place, so I love a gray, rainy day once in awhile. Our rainy season was supposed to start earlier this month, and we've hardly had any rain. We might face water restrictions soon ( washing cars, watering lawns). I also love to curl up with a cup of hot coffee or tea and watch it pour! I hope we get a tropical storm this summer - I love how dramatic those storms are. Take care! The funny thing is that when the monsoon hit Kerala 3-4 days later than the anticipated date the newspapers were all about how the monsoon will be terrible and how the lack of rain in June would be awful for Mumbai. And so far, we had week of heavy rains and between Thursday last week and Sunday it rained near constantly. Friday they even shut some schools because of flooding and the local train services were disrupted due to the tracks being flooded. I got to love how quickly the doomsayers make predictions. To me this year looks normal so far. I love the gloominess and chill in the air the monsoon brings. My study is critically hot during the Summer, but now it is just perfect and I am enjoying working from my desk rather than the dinning table.